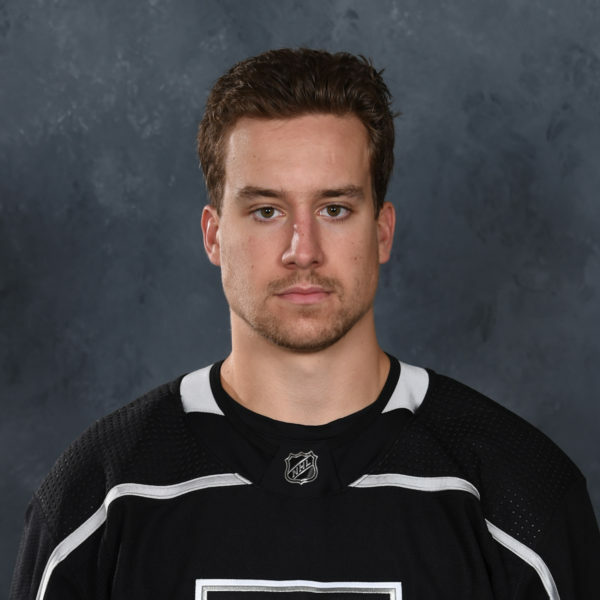 We talk a lot about Brett Sutter, the leader, but this write up isn’t all about that. Besides, Lisa Dillman already portrayed that perfectly earlier this week. 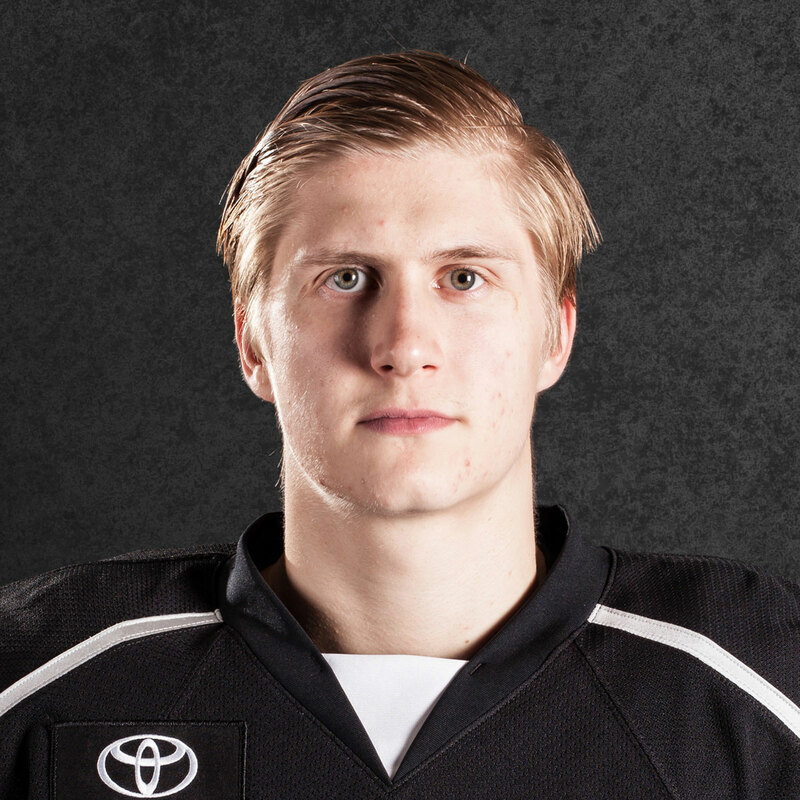 Tonight, we talk about Brett Sutter, the top-six forward. 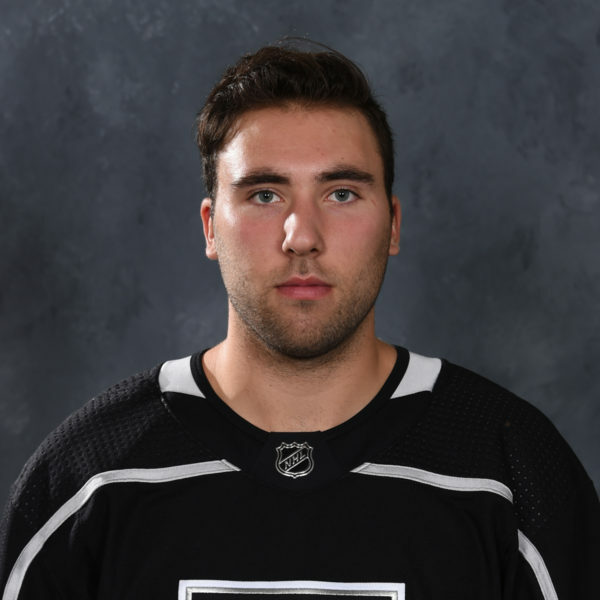 The player who collected three goals in tonight’s 5-4 Ontario Reign shootout defeat in San Diego, his first hat trick since October 28, 2012, which came with the Charlotte Checkers, against the Peoria Rivermen, who haven’t played a game in the AHL since that season. Sutter opened the scoring inside two minutes into the game, converting after a hot start from the Reign. He added his second late in the second period, a power-play goal, to bring the team back to within one late in the middle stanza. 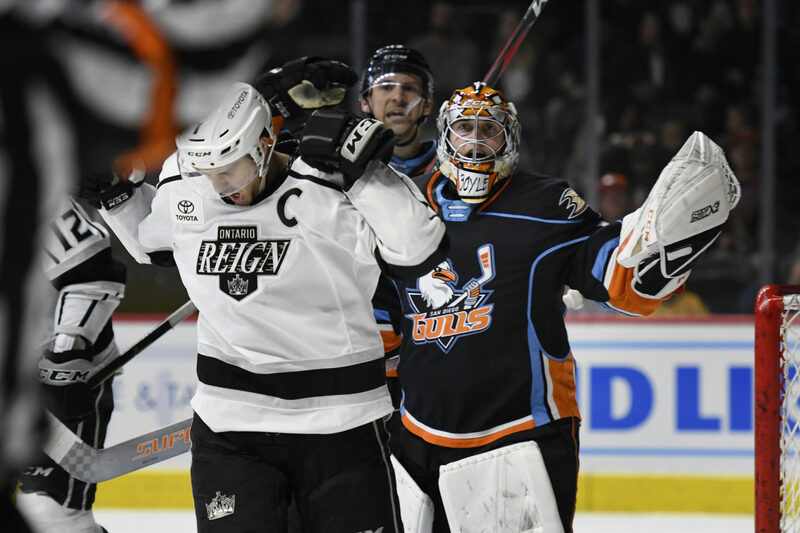 He scored for the third time very late in regulation, forcing overtime as the Reign completed the comeback to earn a point. Sutter’s third goal was his 19th tally of the season, tying a professional career high, set with Charlotte during the 2012-13 season. Sutter also broke the 40-point barrier on the evening, the third time he’s reached that mark in the AHL. The 31-year-old forward recently played in his 800th career AHL game earlier this month. With more outputs like tonight, he might just make good on his claim of playing in 800 more. As far as the game itself, as behind as the Reign were in the opening 20 minutes, is as good as they were in the final 40 of regulation. After falling behind 4-1 during the first period, Ontario showed their character once again, with a fine effort in the second and third frames. 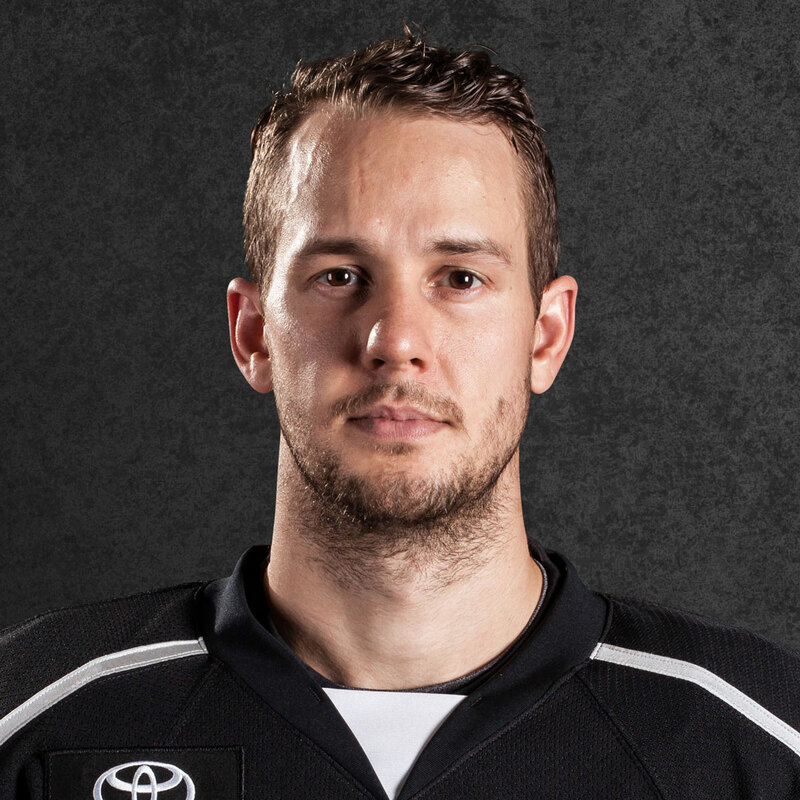 The Reign struck twice in the second, with Sutter’s tally equalizing things in the third. 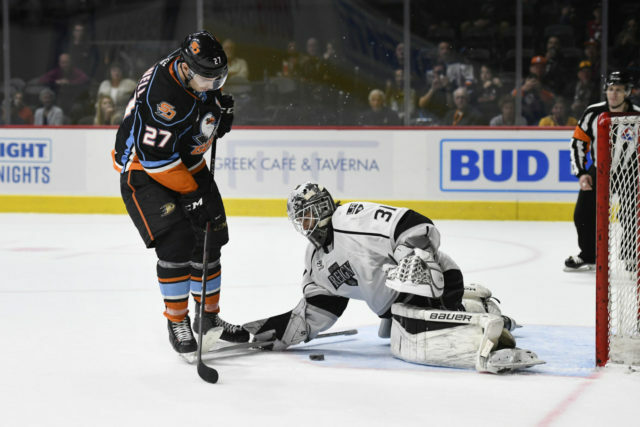 Peter Budaj made several big stops in net throughout the game and overtime to help earn the Reign another point, giving them three of four on the weekend. 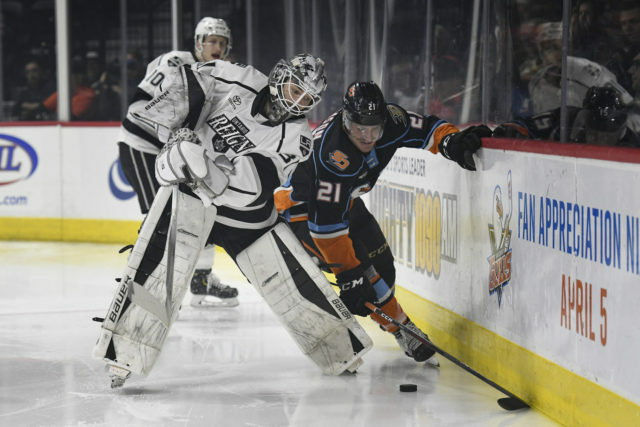 With the Reign’s falling in the shootout, and Colorado and San Jose both falling in overtime, the Reign remain mathematically alive in the postseason race, if only by a hair. 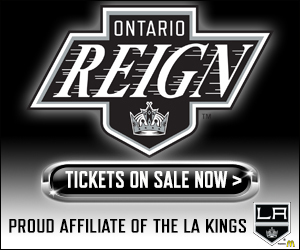 Any Reign point dropped, or a San Jose point gained, would eliminate Ontario from playoff contention. 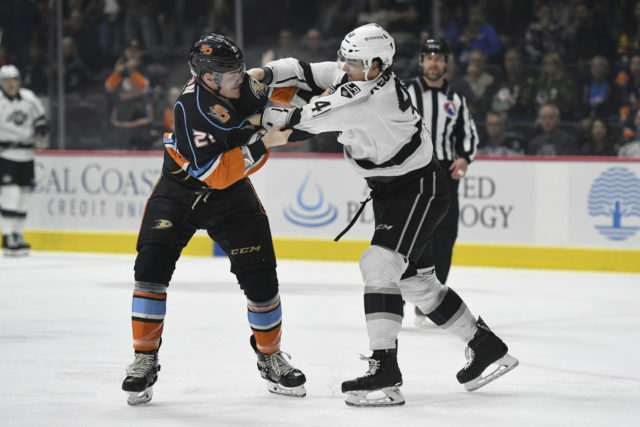 The Reign are back in action on Wednesday, with a trip to Bakersfield, followed by a game in San Jose on Friday against the Barracuda. Tonight just exemplifies that he’s the perfect captain. He does everything for us. He’s a big-time player, he’s a leader. Tonight especially, we were down 4-1 after one period, he gets us going, gets us a point, a very valuable point on the road. Whether it’s faceoffs or big goals or playing aggressive and finishing checks, or just being a good teammate. He’s the guy that the guys lean on and look to, and he’s got the utmost respect of his teammates and from the coaching staff. It was crucial that we got it done. We were trailing by one, we had to kill five minutes, which puts a lot of stress and strain on your killers, obviously, and a lot on Buuds. I thought we held together pretty good with our structure, and we did a good job. It was interesting, because after we killed the penalty, there was an immediate shift after that I thought we looked disorganized and we looked almost like we got a little bit rattled. Throughout the penalty kill, we looked composed, so it’s strange how that went, but, again, we stuck with the game plan. We knew, even after the first period, we were down 4-1, and we just talked about it between the first and the second, and said let’s just keep chipping away and that’s what we did. I’ve been fortunate enough to see Peter play some darn good games for us here with Ontario. He probably had a career year the one year with us and that’s not that long ago, so it’s not like he’s lost it. Things haven’t gone all that well for us as a team, when you look at statistics, so you don’t base it on statistics. You look on a guy that’s been down this path before and again, you’re trailing, it doesn’t look promising and we also talked about that between the first and second. We made a promise to ourselves that Buuds was going to keep battling and that we needed to keep battling in front of him. Buuds did his part, and so did the rest of the players. Well, you’d like to think so. I mean, it’s been a long year and we’ve had some ups and downs. I think, number one, we’ve managed them well. We haven’t gotten too despondent when things haven’t gone great, we haven’t gotten too elated when things have been going well. Over the course of a season, you try to pick some positives from it, and if you were to evaluate our guys and our present situation with the lineup that we have, I think you should be pretty satisfied. There’s some definite growth on our team and the thing I like about our team probably the most is we never quit. These guys battle hard. If you look back at the response we had after a 7-0 loss in Bakersfield, and tonight, to be trailing 4-1, I can’t say enough about these guys and how committed they are and how hard they work for us.